explain the effect of the commoditization of the personal computer. As we learned in the first chapter, an information system is made up of five components: hardware, software, data, people, and process. The physical parts of computing devices – those that you can actually touch – are referred to as hardware. In this chapter, we will take a look at this component of information systems, learn a little bit about how it works, and discuss some of the current trends surrounding it. output devices such as printers and speakers. 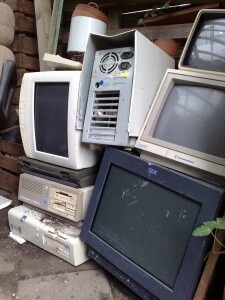 Besides these more traditional computer hardware devices, many items that were once not considered digital devices are now becoming computerized themselves. Digital technologies are now being integrated into many everyday objects, so the days of a device being labeled categorically as computer hardware may be ending. Examples of these types of digital devices include automobiles, refrigerators, and even soft-drink dispensers. In this chapter, we will also explore digital devices, beginning with defining what we mean by the term itself. A digital device processes electronic signals that represent either a one (“on”) or a zero (“off”). The on state is represented by the presence of an electronic signal; the off state is represented by the absence of an electronic signal. Each one or zero is referred to as a bit (a contraction of binary digit); a group of eight bits is a byte. The first personal computers could process 8 bits of data at once; modern PCs can now process 64 bits of data at a time, which is where the term 64-bit processor comes from. As you know, the system of numbering we are most familiar with is base-ten numbering. In base-ten numbering, each column in the number represents a power of ten, with the far-right column representing 10^0 (ones), the next column from the right representing 10^1 (tens), then 10^2 (hundreds), then 10^3 (thousands), etc. For example, the number 1010 in decimal represents: (1 x 1000) + (0 x 100) + (1 x 10) + (0 x 1). Computers use the base-two numbering system, also known as binary. In this system, each column in the number represents a power of two, with the far-right column representing 2^0 (ones), the next column from the right representing 2^1 (twos), then 2^2 (fours), then 2^3 (eights), etc. For example, the number 1010 in binary represents (1 x 8 ) + (0 x 4) + (1 x 2) + (0 x 1). In base ten, this evaluates to 10. As the capacities of digital devices grew, new terms were developed to identify the capacities of processors, memory, and disk storage space. Prefixes were applied to the word byte to represent different orders of magnitude. Since these are digital specifications, the prefixes were originally meant to represent multiples of 1024 (which is 210), but have more recently been rounded to mean multiples of 1000. All personal computers consist of the same basic components: a CPU, memory, circuit board, storage, and input/output devices. It also turns out that almost every digital device uses the same set of components, so examining the personal computer will give us insight into the structure of a variety of digital devices. So let’s take a “tour” of a personal computer and see what makes them function. As stated above, most computing devices have a similar architecture. The core of this architecture is the central processing unit, or CPU. The CPU can be thought of as the “brains” of the device. The CPU carries out the commands sent to it by the software and returns results to be acted upon. The earliest CPUs were large circuit boards with limited functionality. Today, a CPU is generally on one chip and can perform a large variety of functions. There are two primary manufacturers of CPUs for personal computers: Intel and Advanced Micro Devices (AMD). 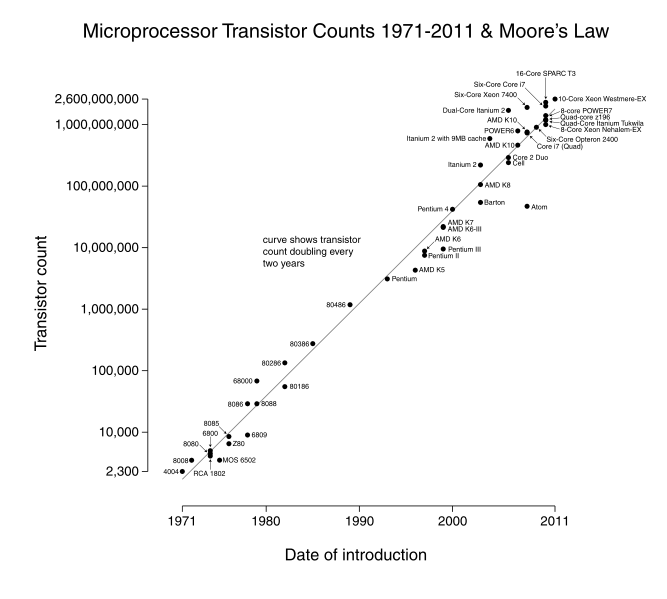 The speed (“clock time”) of a CPU is measured in hertz. A hertz is defined as one cycle per second. Using the binary prefixes mentioned above, we can see that a kilohertz (abbreviated kHz) is one thousand cycles per second, a megahertz (mHz) is one million cycles per second, and a gigahertz (gHz) is one billion cycles per second. The CPU’s processing power is increasing at an amazing rate (see the sidebar about Moore’s Law). Besides a faster clock time, many CPU chips now contain multiple processors per chip. These chips, known as dual-core (two processors) or quad-core (four processors), increase the processing power of a computer by providing the capability of multiple CPUs. We all know that computers get faster every year. Many times, we are not sure if we want to buy today’s model of smartphone, tablet, or PC because next week it won’t be the most advanced any more. Gordon Moore, one of the founders of Intel, recognized this phenomenon in 1965, noting that microprocessor transistor counts had been doubling every year. His insight eventually evolved into Moore’s Law, which states that the number of transistors on a chip will double every two years. This has been generalized into the concept that computing power will double every two years for the same price point. Another way of looking at this is to think that the price for the same computing power will be cut in half every two years. Though many have predicted its demise, Moore’s Law has held true for over forty years (see figure below). There will be a point, someday, where we reach the limits of Moore’s Law, where we cannot continue to shrink circuits any further. But engineers will continue to seek ways to increase performance. The motherboard is the main circuit board on the computer. 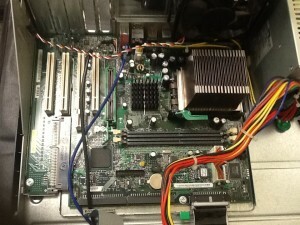 The CPU, memory, and storage components, among other things, all connect into the motherboard. Motherboards come in different shapes and sizes, depending upon how compact or expandable the computer is designed to be. Most modern motherboards have many integrated components, such as video and sound processing, which used to require separate components. The motherboard provides much of the bus of the computer (the term bus refers to the electrical connection between different computer components). The bus is an important determiner of the computer’s speed: the combination of how fast the bus can transfer data and the number of data bits that can be moved at one time determine the speed. When a computer starts up, it begins to load information from the hard disk into its working memory. This working memory, called random-access memory (RAM), can transfer data much faster than the hard disk. Any program that you are running on the computer is loaded into RAM for processing. In order for a computer to work effectively, some minimal amount of RAM must be installed. In most cases, adding more RAM will allow the computer to run faster. Another characteristic of RAM is that it is “volatile.” This means that it can store data as long as it is receiving power; when the computer is turned off, any data stored in RAM is lost. RAM is generally installed in a personal computer through the use of a dual-inline memory module (DIMM). The type of DIMM accepted into a computer is dependent upon the motherboard. As described by Moore’s Law, the amount of memory and speeds of DIMMs have increased dramatically over the years. A relatively new component becoming more common in some personal computers is the solid-state drive (SSD). The SSD performs the same function as a hard disk: long-term storage. Instead of spinning disks, the SSD uses flash memory, which is much faster. Solid-state drives are currently quite a bit more expensive than hard disks. However, the use of flash memory instead of disks makes them much lighter and faster than hard disks. SSDs are primarily utilized in portable computers, making them lighter and more efficient. Some computers combine the two storage technologies, using the SSD for the most accessed data (such as the operating system) while using the hard disk for data that is accessed less frequently. As with any technology, Moore’s Law is driving up capacity and speed and lowering prices of solid-state drives, which will allow them to proliferate in the years to come. 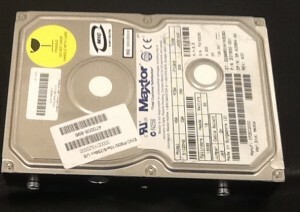 Besides fixed storage components, removable storage media are also used in most personal computers. Removable media allows you to take your data with you. And just as with all other digital technologies, these media have gotten smaller and more powerful as the years have gone by. Early computers used floppy disks, which could be inserted into a disk drive in the computer. 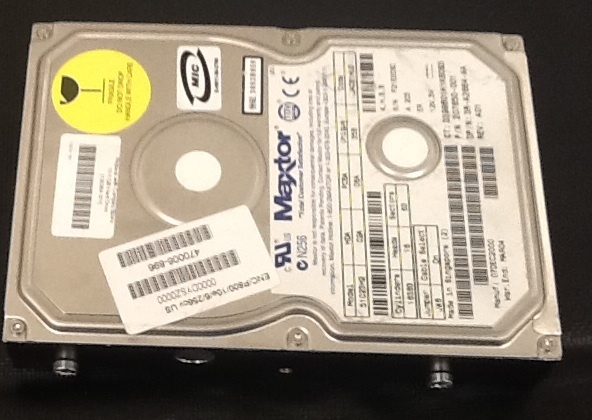 Data was stored on a magnetic disk inside an enclosure. These disks ranged from 8″ in the earliest days down to 3 1/2″. Around the turn of the century, a new portable storage technology was being developed: the USB flash drive (more about the USB port later in the chapter). This device attaches to the universal serial bus (USB) connector, which became standard on all personal computers beginning in the late 1990s. As with all other storage media, flash drive storage capacity has skyrocketed over the years, from initial capacities of eight megabytes to current capacities of 64 gigabytes and still growing. When personal computers were first developed, they were stand-alone units, which meant that data was brought into the computer or removed from the computer via removable media, such as the floppy disk. Beginning in the mid-1980s, however, organizations began to see the value in connecting computers together via a digital network. Because of this, personal computers needed the ability to connect to these networks. Initially, this was done by adding an expansion card to the computer that enabled the network connection, but by the mid-1990s, a network port was standard on most personal computers. As wireless technologies began to dominate in the early 2000s, many personal computers also began including wireless networking capabilities. Digital communication technologies will be discussed further in chapter 5. In order for a personal computer to be useful, it must have channels for receiving input from the user and channels for delivering output to the user. These input and output devices connect to the computer via various connection ports, which generally are part of the motherboard and are accessible outside the computer case. In early personal computers, specific ports were designed for each type of output device. The configuration of these ports has evolved over the years, becoming more and more standardized over time. Today, almost all devices plug into a computer through the use of a USB port. This port type, first introduced in 1996, has increased in its capabilities, both in its data transfer rate and power supplied. Besides USB, some input and output devices connect to the computer via a wireless-technology standard called Bluetooth. Bluetooth was first invented in the 1990s and exchanges data over short distances using radio waves. Bluetooth generally has a range of 100 to 150 feet. For devices to communicate via Bluetooth, both the personal computer and the connecting device must have a Bluetooth communication chip installed. All personal computers need components that allow the user to input data. Early computers used simply a keyboard to allow the user to enter data or select an item from a menu to run a program. With the advent of the graphical user interface, the mouse became a standard component of a computer. These two components are still the primary input devices to a personal computer, though variations of each have been introduced with varying levels of success over the years. For example, many new devices now use a touch screen as the primary way of entering data. Besides the keyboard and mouse, additional input devices are becoming more common. Scanners allow users to input documents into a computer, either as images or as text. Microphones can be used to record audio or give voice commands. Webcams and other types of video cameras can be used to record video or participate in a video chat session. Output devices are essential as well. The most obvious output device is a display, visually representing the state of the computer. In some cases, a personal computer can support multiple displays or be connected to larger-format displays such as a projector or large-screen television. Besides displays, other output devices include speakers for audio output and printers for printed output. Sidebar: What Hardware Components Contribute to the Speed of My Computer? The speed of a computer is determined by many elements, some related to hardware and some related to software. In hardware, speed is improved by giving the electrons shorter distances to traverse to complete a circuit. Since the first CPU was created in the early 1970s, engineers have constantly worked to figure out how to shrink these circuits and put more and more circuits onto the same chip. And this work has paid off – the speed of computing devices has been continuously improving ever since. The hardware components that contribute to the speed of a personal computer are the CPU, the motherboard, RAM, and the hard disk. In most cases, these items can be replaced with newer, faster components. In the case of RAM, simply adding more RAM can also speed up the computer. The table below shows how each of these contributes to the speed of a computer. Besides upgrading hardware, there are many changes that can be made to the software of a computer to make it faster. speed gHz The time it takes to complete a circuit. speed mHz How much data can move across the bus simultaneously. transfer rate MB/s The time it takes for data to be transferred from memory to system. time ms The time it takes before the disk can transfer data. transfer rate MBit/s The time it takes for data to be transferred from disk to system. A personal computer is designed to be a general-purpose device. That is, it can be used to solve many different types of problems. As the technologies of the personal computer have become more commonplace, many of the components have been integrated into other devices that previously were purely mechanical. We have also seen an evolution in what defines a computer. Ever since the invention of the personal computer, users have clamored for a way to carry them around. Here we will examine several types of devices that represent the latest trends in personal computing. In 1983, Compaq Computer Corporation developed the first commercially successful portable personal computer. By today’s standards, the Compaq PC was not very portable: weighing in at 28 pounds, this computer was portable only in the most literal sense – it could be carried around. But this was no laptop; the computer was designed like a suitcase, to be lugged around and laid on its side to be used. Besides portability, the Compaq was successful because it was fully compatible with the software being run by the IBM PC, which was the standard for business. In the years that followed, portable computing continued to improve, giving us laptop and notebook computers. The “luggable” computer has given way to a much lighter clamshell computer that weighs from 4 to 6 pounds and runs on batteries. In fact, the most recent advances in technology give us a new class of laptop that is quickly becoming the standard: these laptops are extremely light and portable and use less power than their larger counterparts. The MacBook Air is a good example of this: it weighs less than three pounds and is only 0.68 inches thick! Finally, as more and more organizations and individuals are moving much of their computing to the Internet, laptops are being developed that use “the cloud” for all of their data and application storage. These laptops are also extremely light because they have no need of a hard disk at all! A good example of this type of laptop (sometimes called a netbook) is Samsung’s Chromebook. The first modern-day mobile phone was invented in 1973. Resembling a brick and weighing in at two pounds, it was priced out of reach for most consumers at nearly four thousand dollars. Since then, mobile phones have become smaller and less expensive; today mobile phones are a modern convenience available to all levels of society. As mobile phones evolved, they became more like small computers. These smartphones have many of the same characteristics as a personal computer, such as an operating system and memory. The first smartphone was the IBM Simon, introduced in 1994. In January of 2007, Apple introduced the iPhone. Its ease of use and intuitive interface made it an immediate success and solidified the future of smartphones. Running on an operating system called iOS, the iPhone was really a small computer with a touch-screen interface. In 2008, the first Android phone was released, with similar functionality. A tablet computer is one that uses a touch screen as its primary input and is small enough and light enough to be carried around easily. They generally have no keyboard and are self-contained inside a rectangular case. The first tablet computers appeared in the early 2000s and used an attached pen as a writing device for input. These tablets ranged in size from small personal digital assistants (PDAs), which were handheld, to full-sized, 14-inch devices. Most early tablets used a version of an existing computer operating system, such as Windows or Linux. These early tablet devices were, for the most part, commercial failures. In January, 2010, Apple introduced the iPad, which ushered in a new era of tablet computing. Instead of a pen, the iPad used the finger as the primary input device. Instead of using the operating system of their desktop and laptop computers, Apple chose to use iOS, the operating system of the iPhone. Because the iPad had a user interface that was the same as the iPhone, consumers felt comfortable and sales took off. The iPad has set the standard for tablet computing. After the success of the iPad, computer manufacturers began to develop new tablets that utilized operating systems that were designed for mobile devices, such as Android. Over the past thirty years, as the personal computer has gone from technical marvel to part of our everyday lives, it has also become a commodity. The PC has become a commodity in the sense that there is very little differentiation between computers, and the primary factor that controls their sale is their price. Hundreds of manufacturers all over the world now create parts for personal computers. Dozens of companies buy these parts and assemble the computers. As commodities, there are essentially no differences between computers made by these different companies. Profit margins for personal computers are razor-thin, leading hardware developers to find the lowest-cost manufacturing. There is one brand of computer for which this is not the case – Apple. Because Apple does not make computers that run on the same open standards as other manufacturers, they can make a unique product that no one can easily copy. By creating what many consider to be a superior product, Apple can charge more for their computers than other manufacturers. Just as with the iPad and iPhone, Apple has chosen a strategy of differentiation, which, at least at this time, seems to be paying off. Personal computers have been around for over thirty-five years. Millions of them have been used and discarded. Mobile phones are now available in even the remotest parts of the world and, after a few years of use, they are discarded. Where does this electronic debris end up? Often, it gets routed to any country that will accept it. Many times, it ends up in dumps in developing nations. These dumps are beginning to be seen as health hazards for those living near them. Though many manufacturers have made strides in using materials that can be recycled, electronic waste is a problem with which we must all deal. Information systems hardware consists of the components of digital technology that you can touch. In this chapter, we reviewed the components that make up a personal computer, with the understanding that the configuration of a personal computer is very similar to that of any type of digital computing device. A personal computer is made up of many components, most importantly the CPU, motherboard, RAM, hard disk, removable media, and input/output devices. We also reviewed some variations on the personal computer, such as the tablet computer and the smartphone. In accordance with Moore’s Law, these technologies have improved quickly over the years, making today’s computing devices much more powerful than devices just a few years ago. Finally, we discussed two of the consequences of this evolution: the commoditization of the personal computer and the problem of electronic waste. Write your own description of what the term information systems hardware means. What is the impact of Moore’s Law on the various hardware components described in this chapter? Write a summary of one of the items linked to in the “Integrated Computing” section. Explain why the personal computer is now considered a commodity. The CPU can also be thought of as the _____________ of the computer. List the following in increasing order (slowest to fastest): megahertz, kilohertz, gigahertz. What is the bus of a computer? Name two differences between RAM and a hard disk. What are the advantages of solid-state drives over hard disks? How heavy was the first commercially successful portable computer? Review the sidebar on the binary number system. How would you represent the number 16 in binary? How about the number 100? Besides decimal and binary, other number bases are used in computing and programming. One of the most used bases is hexadecimal, which is base-16. In base-16, the numerals 0 through 9 are supplemented with the letters A (10) through F (15). How would you represent the decimal number 100 in hexadecimal? Review the timeline of computers at the Old Computers website. Pick one computer from the listing and write a brief summary. Include the specifications for CPU, memory, and screen size. 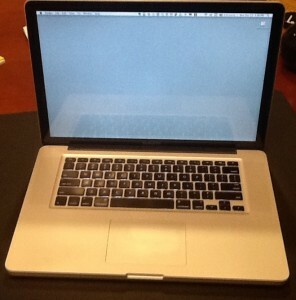 Now find the specifications of a computer being offered for sale today and compare. Did Moore’s Law hold true? The Homebrew Computer Club was one of the original clubs for enthusiasts of the first personal computer, the Altair 8800. Read some of their newsletters and then discuss some of the issues surrounding this early personal computer. If you could build your own personal computer, what components would you purchase? Put together a list of the components you would use to create it, including a computer case, motherboard, CPU, hard disk, RAM, and DVD drive. How can you be sure they are all compatible with each other? How much would it cost? How does this compare to a similar computer purchased from a vendor such as Dell or HP? Review the Wikipedia entry on electronic waste. Now find at least two more scholarly articles on this topic. Prepare a slideshow that summarizes the issue and then recommend a possible solution based on your research. As with any technology text, there have been advances in technologies since publication. What technology that has been developed recently would you add to this chapter? What is the current state of solid-state drives vs. hard disks? Do original research online where you can compare price on solid-state drives and hard disks. Be sure you note the differences in price, capacity, and speed. Previous: Ch.1:What Is an Information System?